You know by now that you need a Facebook Business Page. You’ve seen the statistics. You know that Facebook’s more than two billion monthly active users make it an impossible platform for any business to ignore. The fact is being on Facebook makes it easier for people to discover and interact with your brand online. So, let’s dive into how to create a Facebook Business Page. 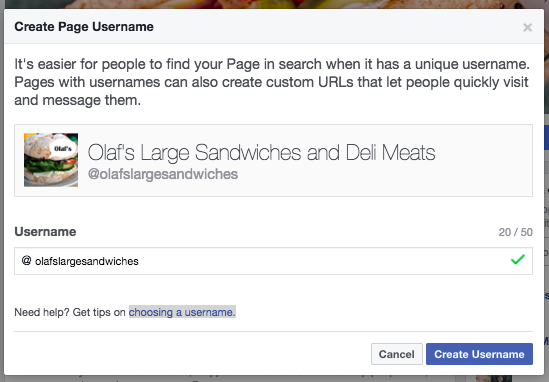 Follow these steps and you’ll have your Page up and running by end of day. Go to facebook.com/business and click Create a Page in the top right hand corner. You’ll be greeted with several business type options including local business or place, brand or product, and cause or community. 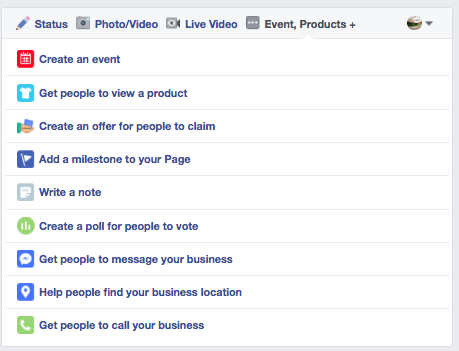 Select the type of business you’re creating the Facebook Page for. If your business type falls into more than one of the category options, choose the one your customers are most likely to think of when they think about your business. When you click on a business type, a box will open asking for a few further details, like the name of your business, your address, and your Page category. 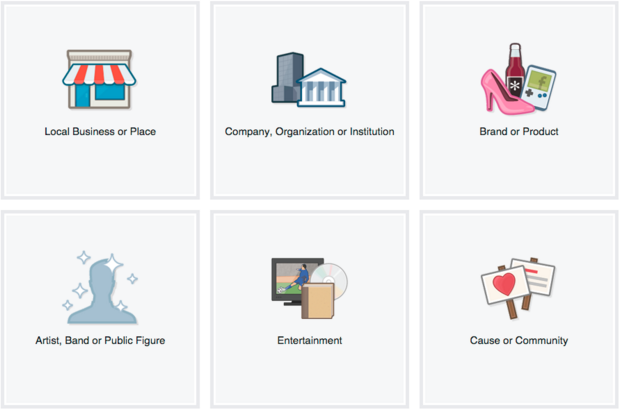 Categories are basically sub-types within the larger business category you’ve already chosen. When you start typing in the category field, you’ll see a list of potential category options to choose from. When you’re ready, click Get Started. Note that doing so indicates your acceptance of Facebook’s terms and conditions for Business Pages, so you might want to check those out before you proceed. 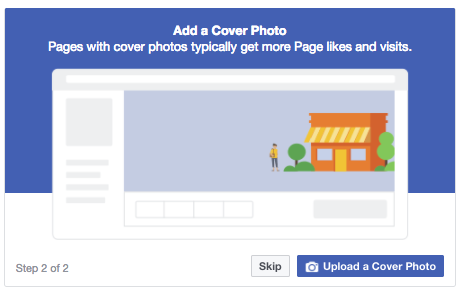 Next, you’ll upload profile and cover images for your Facebook Page. It’s important to create a good visual first impression, so choose wisely here. Make sure the photos you choose align with your brand and are easily identifiable with your business. You’ll upload your profile image first. This image accompanies your business name in search results and when you interact with users, and also appears on the top left of your Facebook Page. If you’re a big brand, using your logo is probably a safe way to go. If you’re a celebrity or public figure, a picture of your face will work like a charm. And if you’re a local business, maybe a well-shot image of your signature offering is what will allow a potential follower or customer to make the connection immediately. Your profile picture will appear as a square on your Facebook Page, but will be cropped to a circle in ads and posts, so don’t put any critical details in the corners. Once you’ve chosen a great one, click Upload Profile Picture. Now it’s time to choose your cover image, the most prominent image on your Facebook Business Page. This image should capture the essence of your brand and convey your brand personality. It will display at 820 x 312 pixels on desktop or 640 x 360 pixels on mobile. The image must be at least 400 pixels wide and 150 tall. Once you’ve selected an appropriate image, click Upload a Cover Photo. Ta-da! Your page is alive, albeit it extremely sparse. At this point, you’ll be prompted to take a quick walk-through of a few features. Unless you’re already well aware of how Facebook Business Pages operate, we recommend clicking through the prompts, just so you know where everything is. It only takes a few seconds. Of course, while the skeleton of the Facebook Page for your business is now in place, you’ve still got some work to do before you share it with your audience. This is your opportunity to tell people about your business. It should be just a couple of sentences (maximum 155 characters), so there’s no need to get too elaborate here. 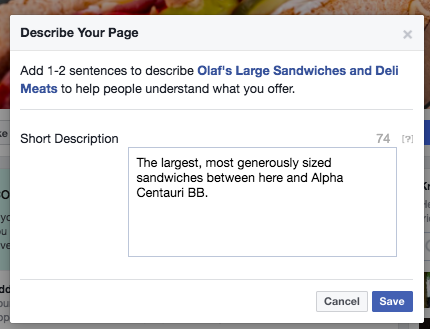 Click Add a Short Description, then just share what your customers need to know as clearly and concisely as possible. You can add a longer description later on. Click Save when you’re done. Your username, also called your vanity URL, is how you’ll tell people where to find you on Facebook. Your username can be up to 50 characters long, but don’t use extra characters just because you can. You want it to be easy to type and easy to remember. Your business name or some obvious variation of it is a safe bet. Click Create a Username for Your Page to set up your vanity URL. Click Create Username when you’re done. 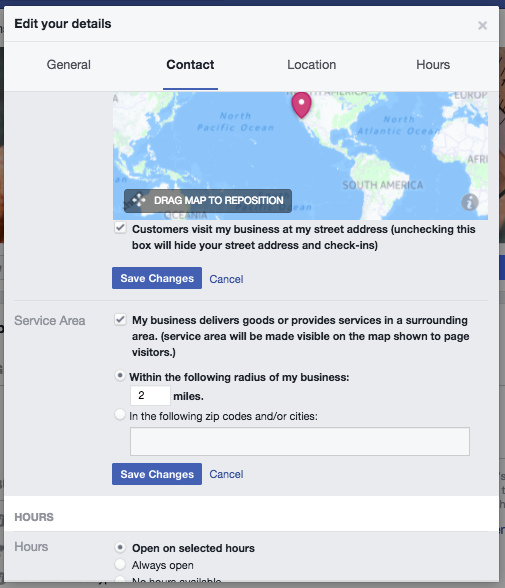 A box will pop up showing you the links people can use to connect with your business on Facebook and Facebook Messenger. 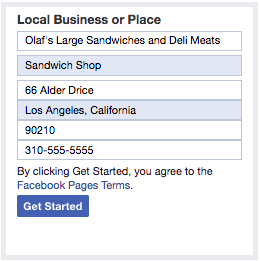 Click OK to continue filling in your Facebook for business Page details. 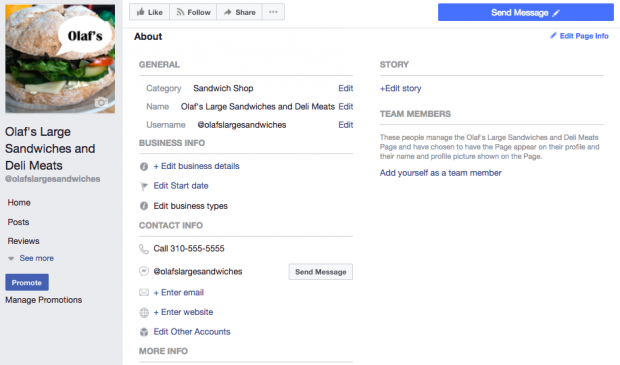 While you might be tempted to leave the details for later, it’s important to fill out all of the fields in your Facebook Page’s About section right from the start. As Facebook is often the very first place a customer goes to get information about you, having it all there is extremely important. If someone is looking for a business that’s open till 9 and can’t find this information on your Page, they’ll surely keep looking until they find another place that’s more forthcoming. It’s also a good idea to list information about your Facebook Messenger protocol, such as your customer service reps’ online hours and estimated response time. To get started, click About in the left-hand menu of your Facebook Page. From this screen, you can add or edit your specific business details, like your start date, contact information, and other social accounts. Depending on your type of business, you may be able to add specific details like a menu or information about your price range and whether you offer valet parking. This is also the screen where you can add a longer description of your business. Click Edit Story on the right side of the Page to provide a detailed description of what your business offers customers and why they should Like or Follow your Page. This is a great place to set expectations about how you’ll interact with fans through your Facebook Page for business purposes and to offer a compelling reason for them to engage with you online. To specify your business location and hours, click Edit Page Info on the top right of the screen. Before you start inviting people to like the Facebook Page for your business, you’ll want to make sure you share some valuable content. You can create some of your own posts, or share relevant content from thought leaders in your industry. You could also create a more specific type of post, like an event or product offer—just click through the tabs at the top of the status box to bring up all the options. Make sure that whatever you post offers value for your visitors when they arrive at your Facebook Page, so they’ll be inclined to stick around. Your Facebook Business Page now represents a robust online presence that will make potential customers and fans feel comfortable interacting with you. 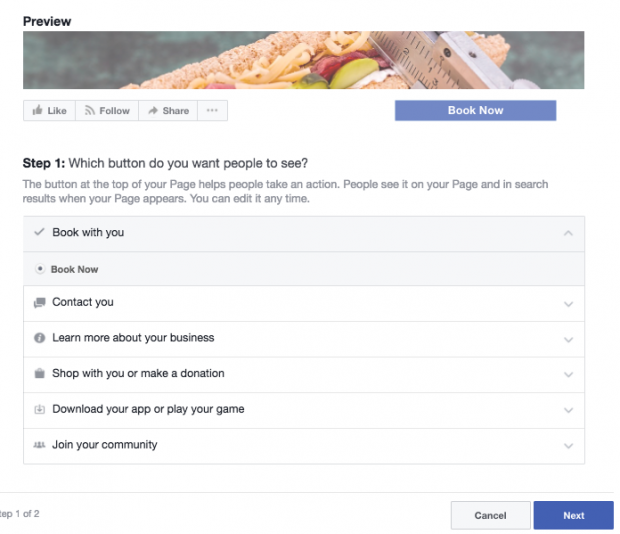 Now you’re ready to give your Facebook Business Page a bit of a nudge. Invite family and friends to like the Page. Use your other channels, like your website and Twitter, to promote it. Add “follow us” logos on your promotional materials and/or email signature. If you’re comfortable with it, you can even ask your customers review you on Facebook, too. Now that you’ve got the basics of how to setup a Facebook Business Page in place, it’s time to think about ways to optimize your Page to maximize engagement and meet your Facebook marketing goals. Here’s a quick video overview of the steps you can take to optimize your Facebook Business Page. We’ll dig into these components in more detail below. There are hundreds of reasons why people visit your page, and you may not be able to provide them with all the information they need right on your Page. But you can provide them with a way to get it by setting up a call-to-action (CTA) button. Facebook’s built-in CTA button makes it virtually frictionless to give the consumer what they’re looking for, including allowing them to engage with your business in real life. By default, Facebook adds a Send Message button, encouraging visitors to contact you through Facebook Messenger. But you can change this to allow visitors to learn more about your business, shop, download your app, or book an appointment. 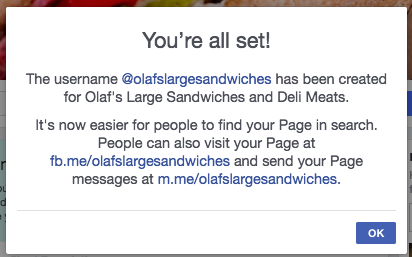 To customize your CTA, hover your mouse over the Send Messagebutton on your Facebook Page, then select Edit Button. Choose the type of button you want, then select the specific message to appear on the button. When you’re happy with your choice, click Next. Depending on the button you chose, you may be asked to select some additional options. When you’re ready, click Finish and your call-to-action button will go live. Is there important information you want all visitors to your Page to see? A promotion you don’t want them to miss? A top-performing piece of content you want to show off? Put it in a pinned post. A pinned post sits at the top of your Facebook Page, just under your cover image, so it’s a great place to put an attention-grabbing item that will draw your visitors in and make them want to stick around. 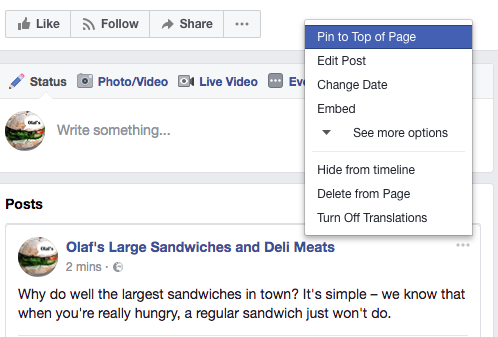 Start by writing a normal post, or scrolling down your feed to find an existing post you want to pin to the top of your Page. Click the three dots on the top right of the post, then click Pin to Top of Page. Once you’ve pinned the post, you’ll see a blue thumbtack icon in the top right corner. Tabs appear on the left-hand side of your Facebook Page, and include standard options such as the About section and photos. You can take your Page to the next level by adding other tabs and apps that enhance the user experience. Facebook tab apps, such as TabSite, allow you to build custom tabs so that you can run campaigns and contests, share special offers, and capture leads. For other tab options, check out our list of 32 useful Facebook Page apps for business. If you are a developer or are working with a developer, and your Page has more than 2,000 fans, you can also create custom tabs from scratch. For more information on this, see the Facebook for Developers guide on Using Page Tabs. Since Facebook is, after all, a social network, it’s a good idea to use your Page to build a community for your business rather than viewing it as simply an extension of your online presence. One way to build community is to feature other Pages that are relevant to your business but not competitors. For example, if you run a shop in a popular shopping area or mall, you could feature other shops in the same area, like an online version of your local business improvement association or chamber of commerce. If you have a virtual business, you could feature other businesses in your industry that could provide additional value for your followers without competing directly with your products. To feature a Facebook for Business Page in your Likes Pages section, click the more icon (three dots) under the Page’s cover photo, then click Like as Your Page. If you have more than one Facebook Business Page, choose which one you want to use to Like the other business, then click Submit. Your Facebook Page settings allow you to get into some pretty fine details about who can administer the page, where the page is visible, words banned from the page, and so on. You can also see how fans are interacting with your Page, including who has favorited it, and so much more. Think of the Settings tab as your behind-the-scenes console for every adjustable parameter available to you. Take a few minutes to go through each setting and make sure that it’s optimized for how you want to manage the Page and how you want your audience to interact with you. To access your settings, just click Settings at the top right of your Facebook Page. It’s important to check your settings regularly, as your preferences and requirements may change as your business—and social following—grows. The more information you have about your audience, the more content you can create to satisfy their needs. Facebook’s Page Insights makes it easy to gather data about how your fans are interacting with your Page and the content you share. Insights gives you information about your Page’s overall performance, including data on audience demographics and engagement. You can see metrics on your posts so you can understand how many people you’re reaching. You’ll also see how many comments and reactions are gained from specific posts—data that helps you plan future content. A key feature of Insights is the ability to see how many people have clicked on your call-to-action button, website, phone number, and address. This data is divided by demographics such as age, gender, country, city, and device, making it easier for you to tailor future content to your audience. For more details, check out our post on how to learn from Facebook Insights. Backlinks help boost the credibility of your Facebook Business Page and may help improve your search engine ranking. Simply link to your brand’s Facebook Page wherever you can. Include a link at the bottom of your blog posts and where appropriate on your website. Encourage other companies and bloggers to do the same whenever possible, such as when sharing content or mentioning your business. The coveted verification badge shows visitors to your Facebook Page that you’re legit—so they can be confident they’re dealing directly with your brand and not with an imposter or fan page. We lay out the step-by-step instructions in our post on how to get verified on Facebook. Once your Facebook Page is set up and optimized, check out our full guide to marketing on Facebook to take your Facebook strategy to the next level. Can I use messenger without facebook app? Where is delete my account page on instagram? Can i see who blocked me on Fb? Can i see someone who blocked me on facebook?